A cluttered desk scattered with weeks of mail, invoices, receipts and numerous other materials, would make it seem like an organizational mess to an outsider. However, beyond the desk, covering the walls and lining cabinets and bookshelves are numerous magazines, awards, and other sports memorabilia that portray the successes of a distinguished man. Behind the desk sits a man who seems to have all the time in the world, and is always sporting a smile on his face. Tom McGuire has been involved with Sports Information at Bloomsburg University for more than 23 years, and is in his 14th year as Director of Sports Information. McGuire oversees the 20 varsity sports in the Huskies arsenal as well as performing duties as the Athletic Marketing and Promotion director. During McGuire’s tenure at Bloomsburg University, sponsorships have increased from $7,500 to nearly $50,000 per year, and overall he raised over $200,000 toward athletic scholarships across all athletic teams. McGuire has been a sports enthusiast all of his life, since the age of five. He began competing in sports in 4th grade, and participated in high school cross country and basketball all four years. After high school McGuire attended Wilkes University, competing on the cross country team for four years, being named the team’s MVP as a sophomore. After receiving a communications degree, McGuire worked as a disc jockey at a local radio station in the Wilkes-Barre area. After a few months, he received a phone call from the athletic director at Wilkes University asking him to become the cross country coach. He accepted the position and while coaching, McGuire fine-tuned his publicity skills promoting the cross country team in local newspaper write-ups. Within a year, the position of Sports Information Director at Wilkes became available, and McGuire submitted his resume and application with virtually no experience in the field. Once hired as the information director at Wilkes, McGuire began a nine and a half year stint with his Alma Mater. In this role, McGuire’s primary duties were promotion and publicity for the school’s 13 varsity athletic teams. McGuire also hosted the television show Colonel’s Corner, which highlighted all of Wilkes athletic events and programs. After his tenure at Wilkes, McGuire became the Sports Information Director at Bloomsburg, along with being a contributor to the Bloomsburg University Magazine. 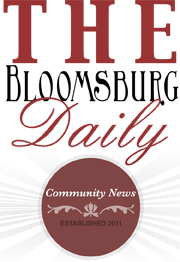 Throughout the 14 years which McGuire has been associated with Bloomsburg University, he accomplished many feats. In 2006, McGuire promoted former BU running back Jamar Brittingham for the Harlon Hill Award and the D2 Player of the Year Award—taking the formerly unknown athlete to a third place finish in final voting. McGuire repeated his accomplishments in 2010 by taking freshman running back Franklyn Quiteh to a sixth place finish in balloting. Also in 2006, McGuire promoted head football coach Danny Hale which culminated in a top 10 finish in the first ever Liberty Mutual Coach of the Year award. Hale and the Huskies were featured in a national television presentation hosted by Keith Jackson on ABC Sports. As if the list of accomplishments was not long enough, McGuire also has mentored nine students in sports publicity, opening many doors for different careers. Students who shadowed under McGuire now work with the likes of the New Orleans Hornets, University of Alabama Birmingham, Georgia Tech, and IUP. Sophomore mass communication major Enrique Josephs was recently employed by McGuire to announce the Huskies sporting events. In just one semester, Josephs has covered matches for the Huskies including men’s and women’s basketball, lacrosse, softball and baseball, and has high aspirations for the upcoming years. McGuire’s motto of giving each team equal share certainly pays off. He sees that the most satisfying part of his job is giving publicity back for student athletes in their hometown newspapers or local television. “Sometimes whenever a student athlete graduates from Bloomsburg, I receive a thank-you note for getting their name out there,” said McGuire. “And that’s what makes this job worthwhile—seeing all the work I do pay off”. Being involved with athletics his entire life; McGuire does not plan to stop now. He has many personal and professional goals that have yet to be attained, but one thing holds true—he is making collegiate sports a better all-around experience for all student athletes affiliated with him. The accolades that McGuire holds are only the beginning in a career that will soon blossom with more success. The Bloomsburg University football team made a big leap in this week’s American Football Coaches Association national Division II poll moving to number two in the country, up from fifth a week ago. The Huskies, 5-0, are coming off a 32-20, come-from-behind win over PSAC East-rival East Stroudsburg this past Saturday. In the game tailback Franklyn Quiteh (Tobyhanna/Pocono Mountain West) scored two fourth quarter touchdowns to help the Huskies overcome an early 10-point deficit, while kicker Dan Fisher (Liverpool/Central Dauphin) connected on four field goals to set a new school record for career field goals. The sophomore now has 31 on the year. For Bloomsburg the number two national ranking equals their best-ever positioning in the poll. Previously the Huskies had been number two on Nov. 8, 2005 and Dec. 12, 2000 (following the team’s loss in the NCAA Division II title game). This coming Saturday the Huskies will be back at Redman Stadium taking on Cheyney with kickoff set for 3:30 p.m. at Redman Stadium. The game will be part of the school’s annual Homecoming celebration. Head coach Danny Hale will also be aiming for win number 200 in his career. He is looking to become the fifth active D2 coach to reach 200 career wins. The shakeup in the poll came after three of the top four teams from last week went down to defeat. North Alabama moves up to the top spot this week after then-No. 1 Northwest Missouri State lost to new No. 8 Pittsburg State (Kan.), 38-35, in the Fall Classic at Arrowhead Stadium. This is the fourth time North Alabama has been ranked No. 1 in the Division II Coaches’ Top 25 Poll, with their last No. 1 ranking occurring on November 2, 2009. The Huskies at number two are followed by No. 3 Delta State (Miss. ), No. 4 Nebraska-Kearney and No. 5 Washburn (Kan.). Nebraska-Kearney’s No. 4 ranking is their highest ever in the AFCA Coaches’ Poll. Shepherd (W.Va.) had the biggest fall, dropping 11 spots to No. 14 after its 28-14 loss to Concord (W.Va.). Valdosta State (Ga.) also fell out of the Top 5, falling to No. 13 after losing to Arkansas-Monticello, 23-9. Pittsburg State (Kan.) made the biggest jump in the poll this week, moving up seven spots to No. 8 after its victory over then-No. 1 Northwest Missouri State. The Bearcats don’t have long to recover as they travel to No. 19 Central Missouri this week in the only Top 25 matchup of the AFCA Coaches’ Poll.